'Think fast. Think big. Think the unthinkable!' As you'll discover in his incomparable memoir, inventor, mechanic, TV presenter and walking tall as the definition of the British eccentric, Edd China sees things differently. An unstoppable enthusiast from an early age, Edd had 35 ongoing car projects while he was at university, not counting the double-decker bus he was living in. Now he's a man with not only a runaround sofa, but also a road-legal office, shed, bed and bathroom. His first car was a more conventional 1303 Texas yellow Beetle, the start of an ongoing love affair with VW, even though it got him arrested for attempted armed robbery. A human volcano of ideas and the ingenuity to make them happen, Edd is exhilarating company. Join him on his wild, wheeled adventures; see inside his engineering heroics; go behind the scenes on Wheeler Dealers. Climb aboard his giant motorised shopping trolley, and let him take you into his parallel universe of possibility. 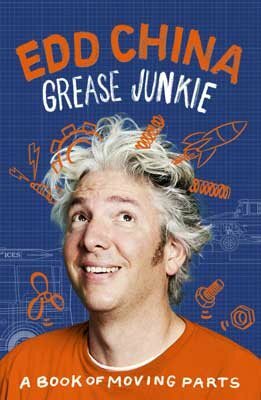 Meet TV host and mechanic extraordinaire Edd China as he signs copies of 'Grease Junkie'! Find out about the adventures of inventor, mechanic, TV presenter, former Wheeler-Dealer co-star and all-round English eccentric, Edd China, as he joins us here in conversation on 17th May to talk about his book ‘Grease Junkie’, from 6pm.